There is a cave bear excavation in the Alps on Monte Generoso, close to the Italian/Swiss border near Como (Northern Italy). 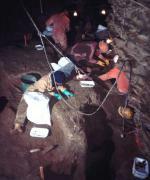 The Monte Generoso Cave has been excavated since more than 15 years and yields cave bear bones by the thousands. If, the excavation team does not have enough money to cover the costs, participants are requested to pay about € 30 per day for accomodation and food at the Vetta Hotel (Swiss side) near the top of the mountain. The excavation area is close to the top of the beautiful mountain (1760 m above sea level) which can be reached by train. The cave (a 20 minutes walk from the hotel) is also open to tourists, so the participants in the excavation will also learn how to guide visitors.